Finding “stuff” to post on social media like Facebook, Twitter and LinkedIn can seem like an overwhelming task. Here is a GREAT way to find things that you can use to add interesting items to your social media properties. We have lots of clients and I can tell you that finding interesting items to post on their Facebook, LinkedIn and Twitter can sometimes seem overwhelming. Mostly we do a search on Google for the industry that they are in, find some relevant news item and then post it, starting from scratch everyday. A twitter user and all his or her followers – this one is not great for me because I have thousands of followers and they may not be in the correct categories to help me develop my marketing content. A specific twitter hashtag – for example the marketing hashtag looks like this #marketing – I am not sure that this will get you the most content as we often do not use a hashtag when posting blog posts or articles. You could wind up with a lot of sales and affiliate links. A specific twitter list – okay, here is the MONEY idea! Just make a list of the best twitter-ers in the marketplace talking about your subject and then every day the paper.li people will aggregate the posts from twitter on that subject and spit you out a newspaper that you can use for content ideas! 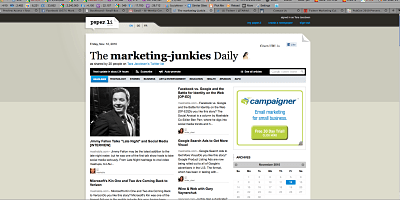 Here is my “newspaper” on Marketing, The Marketing Junkies Daily if you would like to see how this works! If you would like to find out more about using hashtags and how to set up your newspaper and incorporate it into your social media empire, I recommend getting our DIY Social Media Marketing Videos! They are only $47 for a lifetime membership!